The HHM-NVC40 provides a safe non-contact way to check whether an electric line or cable or AC outlet is “hot” (energized). It does so by sensing from a short distance the electromagnetic field created by AC voltage. Even unloaded AC circuits generate electromagnetic fields. Although these fields are extremely weak, their constantly changing nature means that they generate some current. A sensitive non-contact voltage detector can sense this current via induction, in much the same way that a sensitive radio receiver can sense weak radio waves. Noncontact voltage (NCV) detectors, including the HHM-NCV40, cannot detect DC voltages (such as those found in automotive electrical systems) or AC voltage through a wall or metal conduit. Unlike the typical NCV detector, the HHM-NCV40 has adjustable sensitivity—a feature that makes it possible to determine which wire in a bundle is the “hot” wire. This application calls for turning down the sensitivity in stages after the HHM-NCV40 senses voltage. As you reduce sensitivity, at some stage only the energized wire will produce a field strong enough to activate the audible and visual alarms from a short distance. 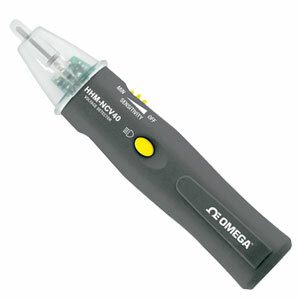 In this way, the HHM-NCV40’s adjustable sensitivity takes the guesswork out of identifying the “hot” wire of a bundle. The HHM-NCV40 also has a wider detection range (5 to 1000 Vac) than the typical NCV unit. The ability to detect the presence of 12 Vac in noncontact fashion is particularly useful during troubleshooting of hardwired process plant and industrial automation systems and equipment such as gas and water valves, fans, lights, relays, inverters, solenoids and horns. Hardwired commercial and residential building doorbells/ buzzers and thermostats are also commonly powered by 12 Vac. The ability of the HHM-NCV40 to detect 480V using its lowest sensitivity setting makes troubleshooting and installing generators and fluorescent lighting ballasts easier, faster and safer. Note: Comes complete with 2 “AAA” batteries and operator’s manual.